When "The Exorcist," based on the novel by William Blatty, came to theaters in 1973, it captured the public's imagination or, more accurately, our nightmares. MAX VON SYDOW: (As Father Merrin) Let your mighty hand cast him out of your servant. GARCIA-NAVARRO: Exorcisms aren't just the stuff of horror movies. Hundreds of thousands of Italian Catholics reportedly request them each year. But when William Friedkin directed the iconic movie, he hadn't seen one. It took him four decades. 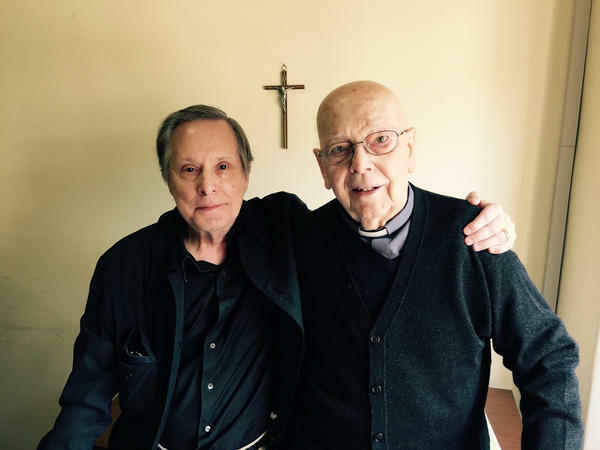 During a meeting with Father Gabriele Amorth, chief exorcist for the Diocese of Rome, Friedkin had a chance to change that. WILLIAM FRIEDKIN: I asked him if he would ever allow me to witness an exorcism, which is never done. It's not an entertainment. It's not for show. But he had a wide berth. And a couple of days later, I got a email from the head of his order saying, OK. Father Amorth will allow you to witness an exorcism on May 1 of 2016 at 3 o'clock in the afternoon. GARCIA-NAVARRO: Friedkin took a small camera with him. And that footage became the central scene of his new documentary called "The Devil And Father Amorth." I asked Friedkin to tell me about the woman whose exorcism he watched, 46-year-old Cristina. FRIEDKIN: She was an architect and a very attractive, intelligent, soft-spoken, wonderful woman. And when she came into the room, I wondered, what is she doing here? She seems to me to be totally together. And then during the exorcism, she completely unraveled. FRIEDKIN: She spoke in a voice that was completely different from her own. She had what I would say was an unnatural amount of strength for a woman her size and age. And her entire personality had altered. GARCIA-NAVARRO: What was it like to be in that room? FRIEDKIN: Terrified. I was scared, seriously scared. I was two feet away from them as I am from you. And I was terrified. Gradually, my fear turned into empathy for her. She was in seemingly unnatural and total pain. GARCIA-NAVARRO: You then go off and talk to brain surgeons and psychiatrists, and you show them the footage that you took. Tell us what they said. FRIEDKIN: Well, I expected they would debunk it and give me a medical or psychiatric term for it. FRIEDKIN: The brain surgeons all said they don't know what this is. These were guys who have done over 5,000 brain surgeries each. So I took it to them. And they all to a person said, we don't know what this is. It's not epilepsy. It's not a lesion in the temporal lobe. We would not know what to remove from her brain to solve this. And the psychiatrist told me, to my astonishment, that psychiatry now recognizes it as something called dissociative identity disorder - demonic possession. The doctor who is the head of the UCLA Hospital said to me in the film, just because we don't know about something doesn't mean it didn't happen. There are many things like radioactivity that we knew nothing about for the longest time. And maybe someday, they'll find some medical or other term for possession. I don't know. GARCIA-NAVARRO: So when you look back at the horror film that you made that was a work of fiction and the actual exorcism that you witnessed, how do you reconcile those two things? FRIEDKIN: I don't have to reconcile them. One is a work of fiction. The other is not. It is what I saw. But Blatty's novel and film is what people think about when they think about an exorcism. There's no doubt of that. And I don't know that that ever happened anytime, anywhere. And I tend to doubt it. GARCIA-NAVARRO: I have to - because I have you here, I have to say that I saw "The Exorcist," of course, when I was a very young child. I think I was about 6 years old. My siblings showed it to me. GARCIA-NAVARRO: Wrong - it scarred me. It scarred me in ways that still exist. FRIEDKIN: I'm sorry. And I mean that. GARCIA-NAVARRO: You know, I'm Catholic, so it really sort of touched something deeply terrifying. And I'm curious why you think the idea of demon possession scares us in that way. Even for people who don't believe in it, it's still something that really affects people. FRIEDKIN: Because it's at the height of the supernatural, things we don't know or understand. We don't understand anything, really. No matter what your religion or lack of it, we don't know anything about the eternal truths. Is there an afterlife? Is there a heaven or a hell? People can have faith and belief, but we know nothing - not the pope, not Bertrand Russell or the greatest thinkers really know the answers to these questions. GARCIA-NAVARRO: You said that you found this exorcism deeply frightening. Is it something that - of what your nightmares are made of, having given so many nightmares to others? FRIEDKIN: I really don't have nightmares. FRIEDKIN: You're sorry to hear, I'm sure. The whole experience really scared me while I was there. But as I told you, my fear turned to empathy for her completely because Father Amorth died last year without having liberated her. And she has sought other exorcists. But he was in a class by himself. GARCIA-NAVARRO: That was William Friedkin, director of "The Exorcist." His new documentary is "The Devil And Father Amorth." GARCIA-NAVARRO: That music gives me chills still. Transcript provided by NPR, Copyright NPR.